A number of national and supranational bodies, including national governments, the European Union (EU), the United Nations (UN), and the US Office of Foreign Assets Control (OFAC), issue and regulate a complicated list of sanctions involving multiple countries and entities. While sanctions have long been employed to effect political change, they are increasingly being used as a first response to geopolitical concerns. Last week the UN Security Council unanimously approved the toughest sanctions against North Korea in two decades. In response, the regime fired six short-range projectiles into the sea off its coast. The missile launch was seen as a low-level response to the new sanctions, which enforce mandatory inspections of cargo leaving and entering North Korea by sea or air; a ban on all sales or transfers of small arms and light weapons; the expulsion of diplomats who engage in 'illicit activities'; and a ban on the export of coal, iron and iron ore to stop the inadvertent funding of North Korea's nuclear or ballistic missile programs. The resolution prohibits other countries from opening branches, subsidiaries and representative offices of North Korean banks, enforcing the termination of all banking relationships within 90 days. Meanwhile 16 individuals have been added to the sanctions 'blacklist'. The changes to North Korean sanctions demonstrate the dynamic nature of sanctions imposed on states, specific companies and individuals. During the 2014 Ukraine crisis, sanctions were imposed by Japan, the EU, Canada and the US, and other countries on dozens of Russian politicians, business people and companies. Russia in turn sanctioned US individuals and embargoed a range of agricultural imports from the US, EU and other countries, including Norway. The EU alone has a complex set of sanctions in force against 33 countries. For businesses trading internationally, sanctions represent a very real threat, and recent penalties issued to companies that have breached various sanctions regimes have involved eye-watering sums. In the UK, the maximum penalty for breaching economic sanctions for the import, purchase or transport of crude oil or petroleum products originating from Iran was imprisonment for two years, a fine, or both. British multinational banking and financial services company, Standard Chartered, paid nearly $1 billion in fines to US regulators and law enforcement agencies for working with Iranian businesses as late as 2013. In January, the International Atomic Energy Agency verified that Iran had fulfilled its obligations under the terms of its nuclear deal and the US and EU reciprocated by lifting a number of Iran's economic sanctions. Iran quickly looked to foreign businesses to help modernise the country's infrastructure, which has suffered from a lack of investment and technology over the past decade. The speed with which the president travelled to Europe once July's nuclear deal had come into action highlighted the depth of Iran's economic problems and its desire to 'open up' to international business. In Italy alone, Iran made deals worth $22 billion covering a number of crucial industries, such as natural gas and high-speed rail. The sheer volume and velocity of changes to sanctions mean that companies trading internationally need to employ enhanced compliance procedures anywhere there may be a risk of a breach. This should include full audits of any activities or dealings with individuals or organisations from countries that are subjected to sanctions; assessments of third parties to determine whether they have had any dealings in the country or with any sanctioned individual; and, for financial institutions, checks whether they hold accounts or funds for sanctioned individuals or organisations. 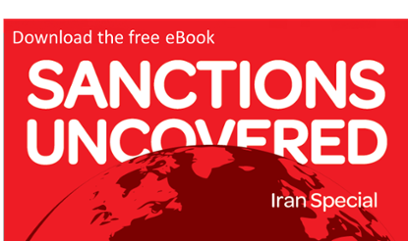 While many sanctions have been lifted, businesses looking to do business in Iran should still recognise the region as high risk from a compliance perspective and be conducting enhanced due diligence checks accordingly. Monitoring difficulties are compounded by the complexity of commercial transactions, and a lack of transparency makes it difficult for companies to know who they are dealing with, and whether dealings are indirectly breaching sanction rules. It is imperative for businesses to enforce a compliance programme based around a robust policy on sanctions, to mitigate the risk of a violation that could have devastating financial and criminal consequences.